Newly arrived in print in the U.K. are two new detective novels set in Italy, one written in English and the other translated from Italian. 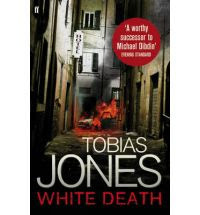 Tobias Jones's White Death is a sequel to his recent Salati Case, featuring Parma private detective Castagnetti (we discover his first name, which reflects the politics of the region, but he doesn't use it). White Death is concerned primarily with the politics of zoning and property development, with a particularly nasty Italian slant. 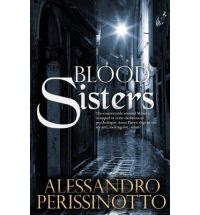 Alessandro Perissinotto's Blood Sisters introduces Bergamo psychologist Anna Pavesi, who has become (against her will, almost) an unofficial detective, tracking down missing persons. Castagnetti is called to a factory where the owner's car has been torched. In the process of seeking the arsonist (who had also been making threatening phone calls), the detective discovers an elaborate scheme to profit from advance knowledge of changes in the city plan, a plot involving a spectrum of the social structure of Parma, from high to low. Castagnetti becomes involved himself, even when his original commission is canceled, and manages to discover at least part of the truth, though only one of the more sympathetic characters suffers from being brought to justice. Pavesi's story has an ingenious structure, alternating passages of the erstwhile detective digging up a corpse and of her telling herself the story of how she got to that point. A socialite comes to her asking for help in discovering the background of a half-sister who died in a hit-and-run accident and whose body is now missing. The socialite is mostly concerned that no scandal be attached to her name, but Pavesi becomes concerned with a much wider pattern of threat and violence. The dead woman turns out to have been involved with several citizens of a Milan suburban town, including a physician who treated her after her accident, and Pavesi has put herself into the crosshairs of all of them. I found Jones's book to be very well written, with a lot of clever evocation of daily life in Parma, while Perissinotto's book is more of an internal monologue. The former book is more about politics and the social realm, while the latter is more about family, love, and loss. Jones's story is (not surprisingly) more an Anglo-American style crime novel, while Perissinotto's is more brooding and introspective, in the mode of several crime novels from Italy and Germany recently. Both are very good, though I found Blood Sisters starting to drag a bit in the last third, after a very fresh and entertaining beginning. So pick your poison, though you won't go very far wrong with either. Shouldn't it be Tobias Jones not Tobias Wolfe? Were you thinking of The Bonfire of the Vanities Man? Thanks, Maxine and Uriah--I keep doing that (there is a writer names Tobias Wolfe, just not this one).